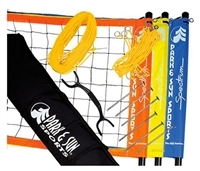 The Spiker volleyball set from Park & Sun includes everything you need to play with quick setup and a completely portable yet sturdy design. 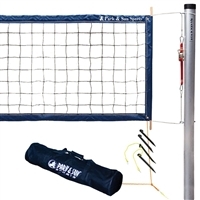 This volleyball set includes a Blue Momentum 32-foot net with slip-on straps for easy setup. and the equipment bag completes the set. 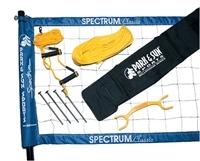 Poles, net, stakes, guyline set, boundary, bag, DVD are all included. 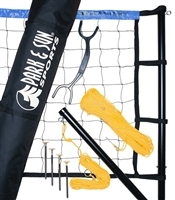 Park and Sun Sports has teamed up with the United States Youth Volleyball League to bring you the Park & Sun USYVL Youth Volleyball Net System. 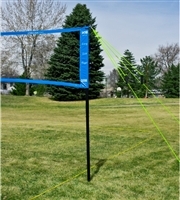 Designed to adapt to young players as they improve and grow, this volleyball net system is an ideal choice for children of all ages. Make learning the game of volleyball accessible and fun! The Park & Sun Tri-Ball-Pro Volleyball Set brings a new dimension to beach volleyball. Play team v. team v. team with the first ever 3 way volleyball net. This lets you bring in more players, created new and exciting plays, and create an unforgettable, colorful sports experience for all.